During July 20 – 24, 2017 the ISS (International Space Station) was transmitting SSTV (Slow Scan Television) images down to earth in celebration of the ARISS (Amateur Radio on the ISS) 20th Anniversary. The ISS transmits SSTV images on celebratory occasions several times a year. More information about upcoming ARISS events can be found on their website ariss.org. Over on YouTube and his blog, user Tysonpower has created a video and writeup of his experiences with receiving the ISS SSTV images using an RTL-SDR, FM Trap filter and a V-Dipole antenna. The V-Dipole antenna is a super simple satellite antenna for NOAA/Meteor/ISS etc satellites that recently became popular due to Adam 9A4QV’s writeup on it. Despite Laptop and PC troubles, he was able to capture several images. He also notes that he was able to use a Baofeng and Yagi antenna to receive the signal indoors. Note that Tysonpower’s YouTube video is narrated in German, but there are English subtitles available if you turn on YouTube’s closed captions which should be on by default on this video. These SSTV broadcasts can usually be easily heard with an RTL-SDR and appropriate satellite antenna such as a QFH, Turnstile or a hand held Yagi. Many listeners have reported in the past as being able to receive them even with non-satellite antennas such as discones, ground plane, rubber duck and long wire antennas, so try your luck even if you don’t have the right antenna. We recommend using the Orbitron software to track the ISS, but you can also use the web tracker on issfanclub.com as recommended by the ARRL. 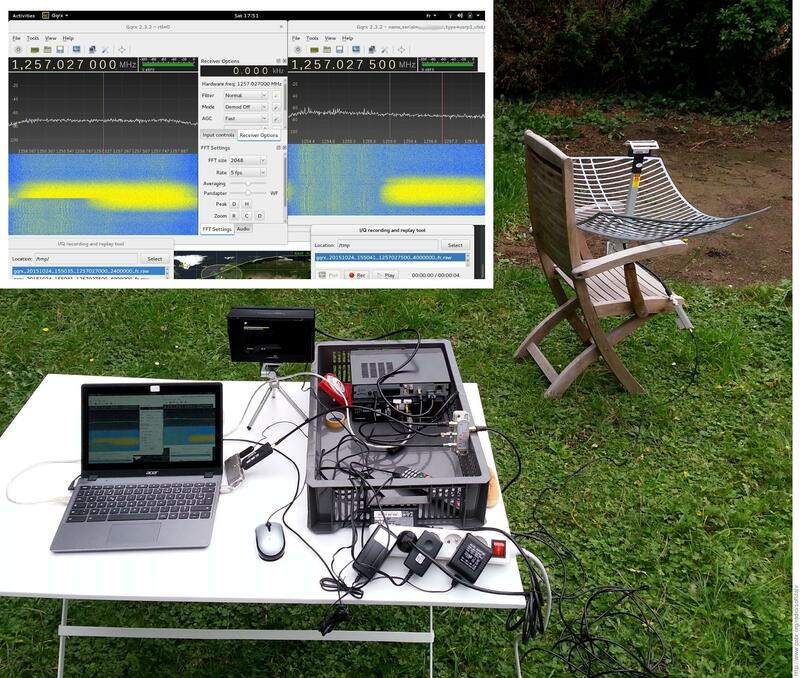 Over on YouTube user surfrockuk shows a fun and educational use of the RTL-SDR. Every now and then astronauts will arrange a ham radio session where they will communicate with a school. An RTL-SDR can be used to listen in on at least the downlink (astronaut talking) portion of these transmissions. The following video shows astronaut Tim Peake transmitting from the international space station (ISS) on Feburary 19th 2016. He was speaking to Oasis Academy in the UK. To receive the signal surfrockuk used an RTL-SDR with a QFH antenna. Many people have reported that other simple antennas such as discones, quartwave ground planes and even long wire antennas have been good enough to receive transmissions from the ISS too. Other transmissions that can be received from the ISS include SSTV, space walk communications, and in the future DATV. The international space station (ISS) is currently testing transmission of a DVB-S digital video signal. At the moment only a blank test pattern is transmitted, but one day they hope to be able to transmit live video properly for the purposes of making live contact with astronauts, and possibly to stream video of scientific experiments, extravehicular activities, docking operations, or simply live views of the Earth from space. I have been able to receive DVB-S broadcasts from the ISS (known as HamVideo or HamTV) with a high-gain 2.4 GHz WiFi antenna ($50), a custom downconverter ($65), a R820T2 dongle, and a software demodulator (Edmund Tse’s gr-dvb). I used to think this could only be done with much more expensive SDR hardware. It is commonly known that rtl-sdr dongles do not have enough bandwidth to capture mainstream satellite TV broadcasts, but the ISS happens to transmit DVB-S at only 2Msymbols/s in QPSK with FEC=1/2, which translates to 2 MHz of RF bandwidth (2.7 MHz including roll-off). Currently the ISS only transmits a blank test pattern. I now believe the BoM will be less than $50 by the time the ISS begins broadcasting interesting stuff on that channel. Pabr uses a 2.4 GHz parabolic WiFi antenna to receive the signal. He writes that ideally a motorized antenna tracker would be used with this antenna to track the ISS through the sky. 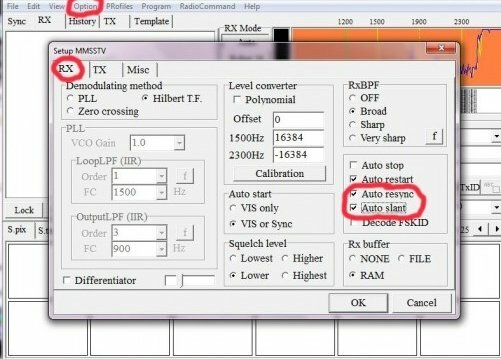 Also since the DATV signal is transmitted at around 2.4 GHz, a downconverter is required to convert the received frequency into one that is receivable with the RTL-SDR. The DATV decoder is available on Linux and requires GNU Radio. To commemorate the 40th Anniversary of the Apollo-Soyuz mission the International Space Station (ISS) is set to transmit 12 Slow Scan TV (SSTV) images this weekend. The images are set to transmit Saturday morning, July 18 10:30 UTC and will run through until Sunday, July 19 21:20 UTC, but they note that the dates are tentative and could be subject to change. The images will be transmitted at 145.80 MHz and will probably be sent in the PD180 SSTV mode with 3 minute breaks between each transmission. SSTV is a type of radio protocol that is used to transmit low resolution images over radio. An RTL-SDR with appropriate antenna can be used to receive these images from the ISS. The signal is usually quite strong, so even a simple whip or long wire antenna may receive these images if placed in a good unobstructed view of the sky. As with the last ISS SSTV event we suggest that to decode the images you use SDR# and pipe the audio into MMSSTV, a freeware SSTV decoding software program. We also suggest using the settings recommended by “happysat”, which are enabling “Auto slant” and “Auto resync” under Options->Setup MMSTV->RX. To know when the ISS is overhead you can track it online using heavens-above.com or isstracker.com. If using heavens-above to predict pass times remember to set it to show all passes, not just the visible ones. 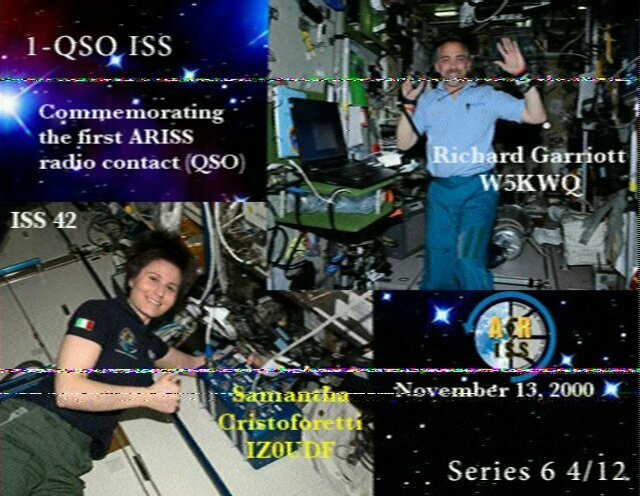 Received SSTV images can be submitted to the ARISS Gallery. 40 years ago this week, the historic joint Apollo-Soyuz mission was conducted. Apollo-Soyuz (or Soyuz-Apollo in Russia) represented the first joint USA-Soviet mission and set the stage for follow-on Russia-USA space collaboration on the Space Shuttle, Mir Space Station and the International Space Station. The Soyuz and Apollo vehicles were docked from July 17-19, 1975, during which time joint experiments and activities were accomplished with the 3 USA astronauts and 2 Soviet cosmonauts on-board. Apollo-Soyuz was the final mission of the Apollo program and the last USA human spaceflight mission until the first space shuttle mission in 1981. To commemorate the 40th anniversary of this historic international event, the ARISS team has developed a series of 12 Slow Scan Television (SSTV) images that will be sent down for reception by schools, educational organizations and ham radio operators, worldwide.The SSTV images are planned to start sometime Saturday morning, July 18 and run through Sunday, July 19. These dates are tentative and are subject to change. The SSTV images can be received on 145.80 MHz and displayed using several different SSTV computer programs that are available on the Internet. Also, as a special treat, on Saturday July 18 the ISS cosmonauts will take time out to conduct an ARISS contact with students attending the Moon Day/Frontiers of Flight Museum event in Dallas Texas. This Russian cosmonaut-USA student contact is planned to start around 16:55 UTC through the W6SRJ ground station located in Santa Rosa, California. ARISS will use the 145.80 MHz voice frequency downlink (same as the SSTV downlink) for the Moon Day contact. More details about these contacts are provided at Upcoming Contacts. 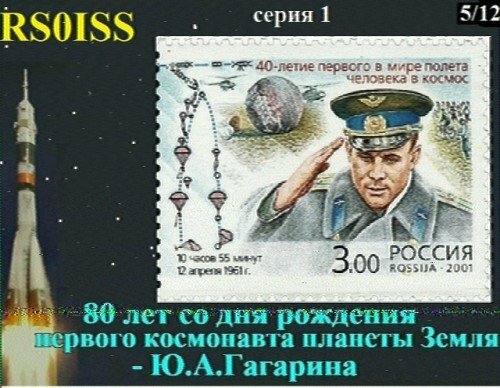 An example SSTV image from the last ISS SSTV event which was to commemorate first man to space Yuri Gagarin’s would be 80th birthday.